Project title: The identification of Cod and Haddock Spawning Habitat using passive Acoustics. P.I.s. Cliff Goudey (MIT Sea Grant) and Rodney Rountree (SMAST). Funding agency: Northeast Consortium Cooperative Research Program. Over the last two years, the Center for Fisheries Engineering Research (CFER) has developed novel underwater passive acoustic probes (hydrophones/recorders) for use cooperatively by commercial fishermen through funding from the Northeast Consortium (NEC). 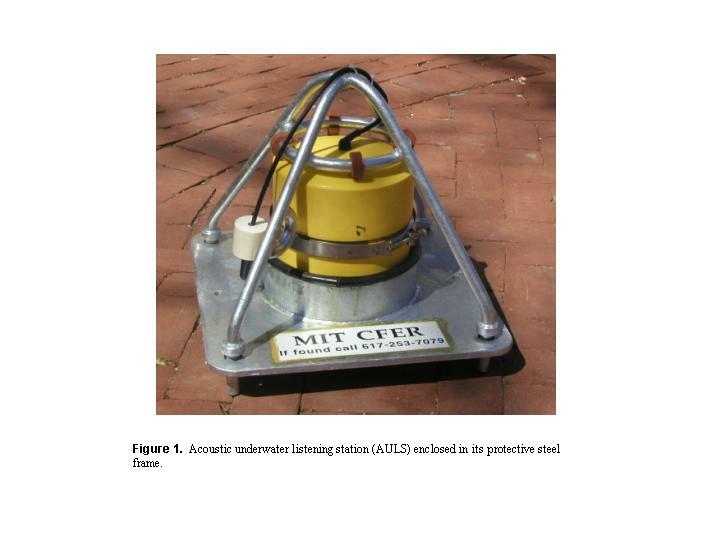 These Acoustic Underwater Listening Stations (AULS) have been employed successfully to areas thought by fishermen to contain spawning haddock in order to determine temporal patterns in haddock spawning vocalizations within the Gulf of Maine. Pictured in Figure 1, AULS takes advantage of low-cost consumer electronics by using Nomad Jukebox MP-3 recorders by Creative Laboratories. Exploiting the unique characteristics of the Nomad 10 GB model, AULS record over 50 hours of data at an 11kHz sampling frequency and stores them uncompressed in a series of 15-minute .wav files. The Nomad technology is power-efficient and easy to use. 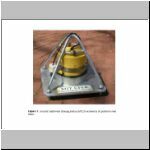 We are currently using an HTI-96-MIN hydrophone (High Tech Industries, Gulfport, MS). Specifications: Sensitivity -165 dB re: 1 V/uPa, frequency response: 2 Hz to 30 KHz, equivalent input self noise: RMS from 1 Hz to 1000 Hz, 78 dB re: 1 uPa 0.08 uBar; Spectral 54 dB re: 1 uPa/sq.root Hz @ 10 Hz , 42 dB re: 1 uPa/sq.root Hz @ 100 Hz , 42 dB re: 1 uPa/sq.root Hz @ 1000 Hz, 10,000 feet (3048 meters) operating depth. The AULS housings are fabricated from P.E. pipe endcaps and are rated to 200 m. A deep-water housing is being developed that is rated for 1,800 m. During two field seasons, we have collected over 3000 hours of acoustic recordings representing over 0000 GB of data during 67 deployments within the Gulf of Maine. The geographic distribution of these deployments is shown in Figure 2. 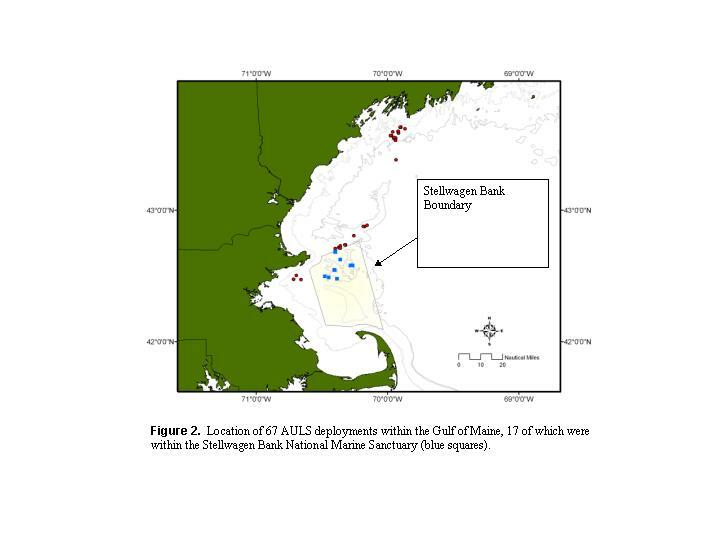 Seventeen 48 h deployments were made within the Stellwagen Bank National Marine Sanctuary (locations marked by blue squares in Figure 2). These deployments recorded over 800 h of underwater sounds. The AULS are deployed by CFER's cooperating fishermen; AULS are set on the seabed much like passive fishing gear. 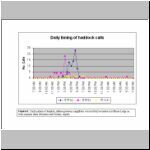 For continuous monitoring of a specific site, the Nomads and the lead-acid gel cells are changed out on a two-day cycle. In addition to the eight units built under our NEC-funded research, 14 additional units have been built, one for each of the NOAA national marine sanctuaries. These units are in use within the sanctuary network in support of the "Sounds of the Sanctuary" educational program. 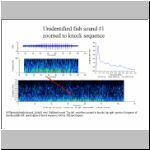 Fish sounds can be used to identify fishes to the species taxonomic level to conduct a census, just as bird sounds are often used to identify birds to species in bird censuses. 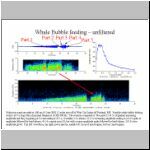 However, our ability to determine species level identifications from recordings is dependent on the availability of reliable reference sounds. 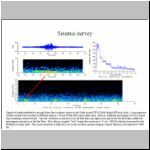 Where reference sounds are not available, field validation of sound source identity is required. Sounds recorded during this project will be catalogued as to species where possible by comparisons with libraries of known fish sounds developed by Marie Fish and William Mowbray (1970) and recently made available to the research community (Rountree et al. 2002). 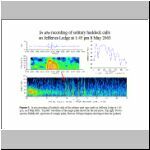 In an ongoing study funded by the Northeast Consortium, Goudey and Rountree have successfully recorded haddock sounds in the Jefferies Ledge-Stellwagen Bank region of the Gulf of Maine Figure 2. 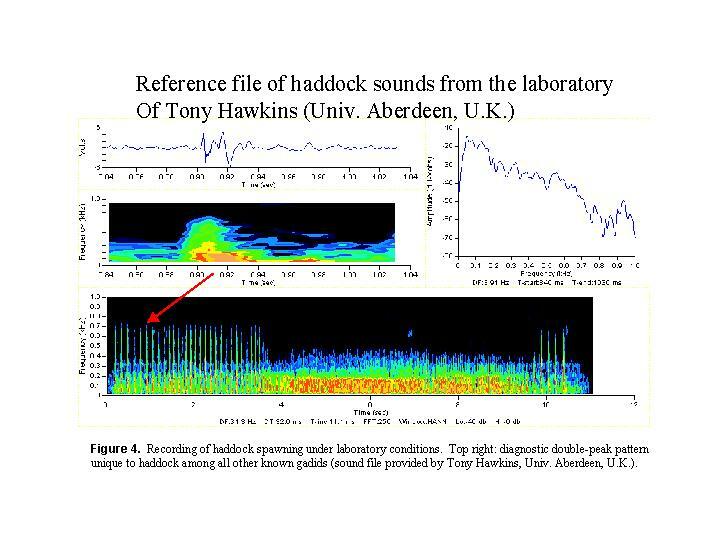 Identification of the haddock sounds was made by comparing the waveforms and spectra of field recordings (Fig. 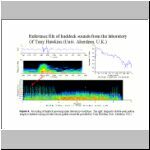 3) to that of known haddock calls recorded in laboratory studies by Dr. Tony Hawkins at the University of Aberdeen, U.K. (Fig. 4). In addition, sound samples were provided to Dr. Hawkins, whom confirmed our identification (pers. comm.). 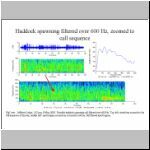 Dr. Hawkins is an internationally acclaimed fisheries scientists who has studied the vocal behavior of haddock and other gadids for over three decades. We have access to the entire Fish and Mowbray (1979) reference file to which we can compare our recorded sound. In addition, Rountree and Goudey have established an extensive international network of scientists studying fish sounds from which we can obtain advice on the identity of unknown sounds. We expect, however, that many of the most common fish sounds that we will record will be unidentifiable with this approach due to the lack of references sounds. 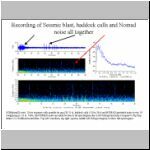 Based on our preliminary analysis of underwater recordings in the Gulf of Maine (Figure 5), we have shown that we can count the number of haddock calls that occur in the vicinity of a AULs unit. Assuming this continues to hold true, we will continue to use the number of calls per unit time as one measure of haddock vocal activity. This methodology has been previously used in studies of fish (e.g., Holt 2003, Rountree et al. 2003), and has been in widespread use for frog studies for many years. It is only possible for us to do this when the number of individuals calling in a given area is relatively low. 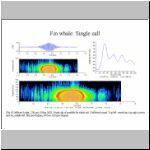 Should we encounter large aggregations of fish all calling at the same time, then we will have to use alternative methods to measure vocal activity levels. Connaughton and Taylor (1995) successfully used a qualitative scale of assigning a value of 0-4 based on the number of call bursts per minute with 4 being continuous sound production. For our purposes, such a qualitative method would suffice. 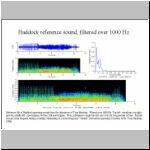 However, we expect to use a more rigorous method of quantifying the sound pressure level of the dominant frequency for haddock calls (see Luczkovich et al. 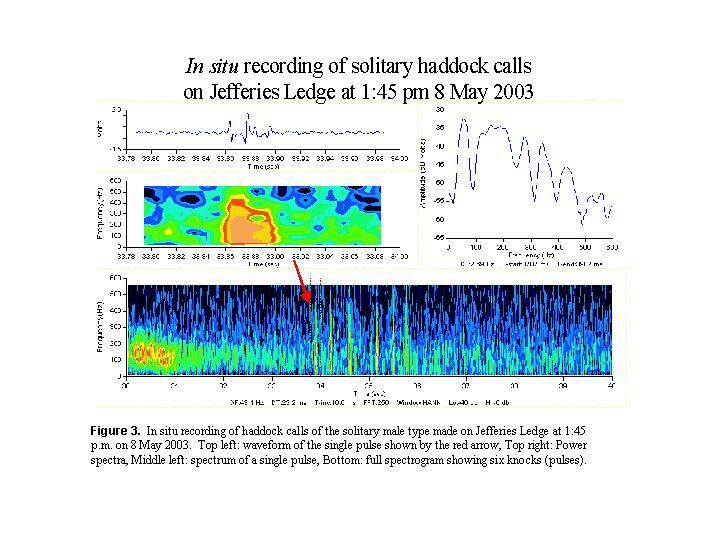 1999 for an example of this technique applied to fishes) and plotting changes in the sound pressure level through time to determine the time of day of peak vocal activity (this can also be applied to spatial mapping). 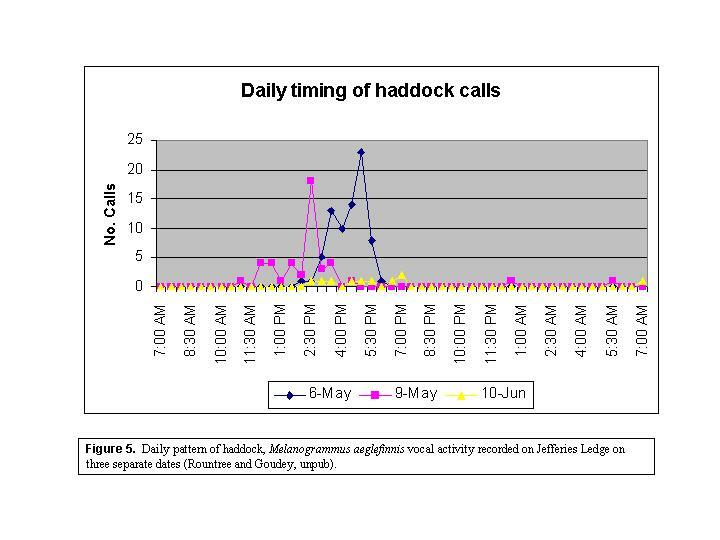 Preliminary results from these on-going studies suggest that there is a precise time of day when haddock spawning takes place based on the peak period of vocal activity (see Fig 5). In situ data on vocal activity/spawning activity patterns of this type have never been documented before for haddock. Identification of the daily timing of spawning activity provides important new data for fisheries managers. 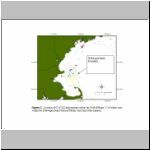 In addition, the successful in situ recording of haddock sounds in the Gulf of Maine and the determination of the timing of vocal activity, paves the way to conduct passive acoustic surveys to identify locations and habitats where haddock spawn (i.e. EFH for spawning). Basically, once we know what time of day haddock are vocally active, and confirm that this vocal activity correlates with spawning activity, then towed array surveys to map spawning areas become feasible. To date, towed array surveys of this type have only been applied to sciaenids in the Gulf of Mexico (Holt 2003).